While white men are expected to be assertive and aggressive leaders, black men and white women are often penalized for that kind of behavior in the workplace. A new study published in Psychological Science, a journal of the Association for Psychological Science, looks at another group: black women. They find that, rather than being viewed as a combination of black men and white women, black women also seem to be expected to act assertively. “Traditionally, women have been assigned to a more subordinate role,” said Robert W. Livingston of Northwestern University, who co-wrote the new study with Ashleigh Shelby Rosette of Duke University and Ella F. Washington of Northwestern. Rosette explained that according to prevailing cultural norms, men are expected to occupy dominant roles, while women are typically prescribed to more communal roles. And previous research has shown that when people think about a prototypical leader, they tend to think about a white man. If women behave in a way that is at odds with these prototypical roles – more dominant and less communal, for example – they will be perceived in a negative light. This “backlash effect” or “agency penalty,” has been found in both experimental research and in studies of real-life settings. While considerable research has examined this gender-based effect, there hasn’t been much research that has looked at gender in conjunction with race. Researchers had assumed that the perceptions that people applied to white women would also be applied to black women, Rosette noted. The authors were inspired in part by a newspaper article describing how Ursula Burns became the CEO of XEROX and the first black woman to head a Fortune 500 company. The article described a lot of behavior that seemed assertive and dominant to Livingston. “It didn’t seem like she was being shy or docile or tiptoeing on eggshells,” he said. In the new study, each participant was shown a picture of a fictitious official at a Fortune 500 company. Each picture was paired with a scenario in which the leader was meeting with a subordinate who wasn’t performing well. Dominant leaders demanded action and were assertive; communal leaders encouraged the subordinate and communicated with compassion. Participants rated the leader on questions like how well the leader handled the situation and how much they thought employees admire this leader. This study does not suggest, however, that racism is no longer a problem or that black women leaders don’t experience problems because they are perceived more like white men than white women. Rosette emphasized the fact that this new study only talks about women who have already reached top leadership roles. “This research doesn’t examine what it is like for black women to get to those roles in the first place,” she said. Livingston suspects that one of the reasons that there aren’t as many black women as white men running Fortune 500 companies is because black women may actually be more likely to be penalized for a mistake. “It is possible that black women can be assertive, but any mistake on the job might be interpreted as evidence that she is not suited for the leadership role,” he said. 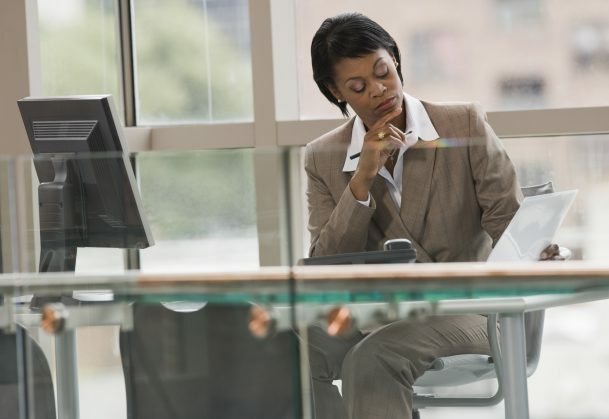 That may make it extremely difficult for black women to climb the corporate ladder. “The reality is that there isn’t a huge population to draw from when it comes to black women leaders, so the evidence that complements our work is anecdotal,” said Rosette. As such, this field of research represents a new frontier at the cross-section of the psychological and management sciences. Perhaps that most important conclusion we can draw from this new study, according to the authors, is that one size does not fit all: context is incredibly important when it concerns issues of race and gender.